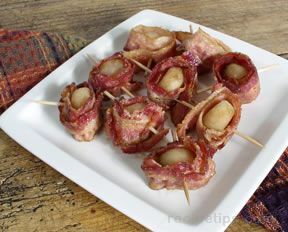 A delicious appetizer of shrimp and water chestnuts wrapped in crispy strips of bacon topped with a creamy horseradish sauce. 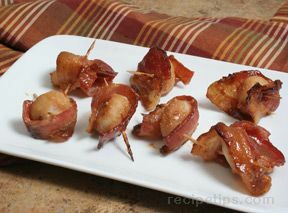 Wrap one piece of bacon around one shrimp and one water chestnut. Repeat. 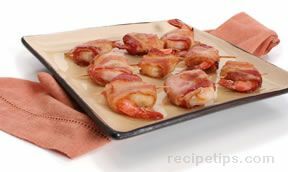 Melt half the butter in a large skillet and cook bacon wrapped shrimp until bacon is brown and crispy, approximately 3 minutes per side. Remove from skillet and set aside. Repeat with remaining butter and bacon wrapped shrimp. Bring cream cheese to room temperature. Then, place all sauce ingredients in a medium bowl and blend well. Season. 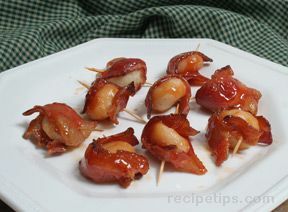 Spoon sauce over bacon wrapped shrimp and water chestnuts.